Hi everyone, Lisa here with my cards for last Friday's classes in Maidstone. 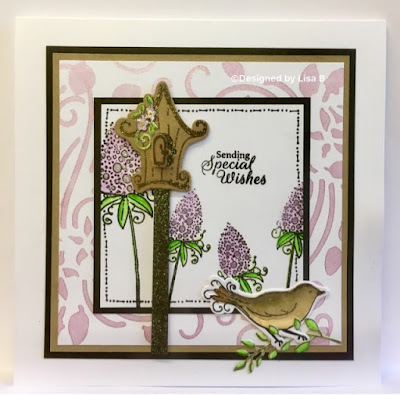 I really enjoyed working with both the stamps and the dies. They make lovely embellishments and the dies have been very cleverly designed so that it's very easy to stamp the coordinating image on to the die cuts. 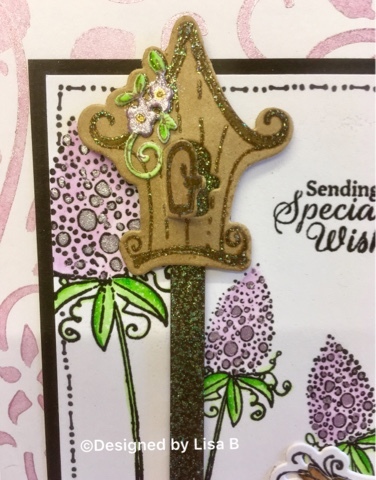 For the first card I applied Lavender Starlights through a stencil for the background. 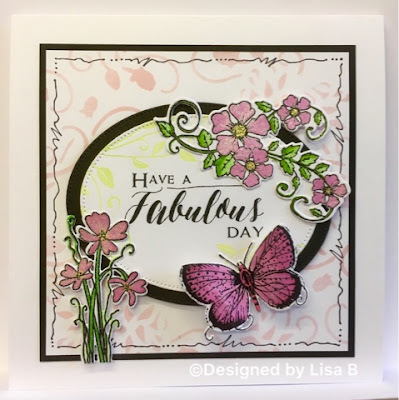 I stamped the lilacs from the Bella Fleur set onto white card with Onyx Black Versafine ink and heat set with WOW! Clear Gloss embossing powder and added a border with a Micron black pen. die cut and stamped the elements - using Vintage Sepia Versafine on kraft card for the birdhouse and heat setting the stamping with WOW! 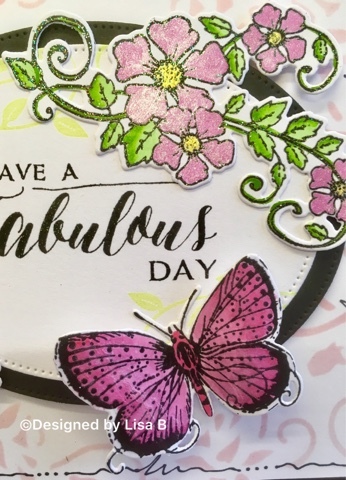 Clear Sparkle EP, then I coloured the stamped images and the die cuts with watercolour pens. The little door on the birdhouse actually opens, so I covered the back with a tiny piece of kraft card. I painted some of the circles on the lilacs with Heather Starlights to add a bit more shimmer. Spun Sugar Distress ink and added detail with a black pen. 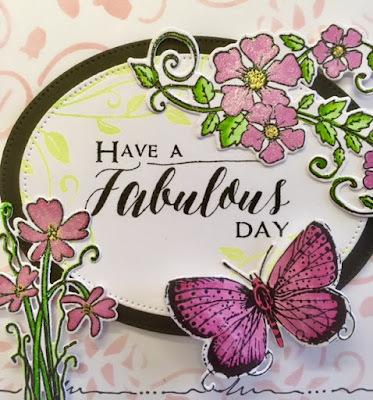 I die cut two pieces of oval card and stamped the branch from the Belle Papillon set on the white oval with Squeezed Lemonade Distress Ink and the sentiment with Onyx Black Versafine. That's it from me. My posts for the next few weeks will be scheduled as I am off to Spain at the weekend. I am so looking forward to doing nothing but lying in the sun!